Profiles4Care » What are Your Management Team’s Values? Two of our most recent clients cleverly used their trial period not just to establish organisational recruitment values benchmarks but also to get an insight to the values of their individual managers and the management team as a whole, with very interesting results. Everyone should be focused on the values of incoming staff but it’s also important to look internally too, as it may be affecting the results of the recruitment process and the success of the organisation as a whole. If you’re familiar with Profiles4Care’s values map ‘region’ indicators from your training then this information will be self-explanatory and the potential issues/strengths evident. If not, what the big blue ‘north west’ band represents is introversion with a preference for task. On the plus side, this means a strong focus on ‘logic’ in the decision making process, very little emotional influence involved, which is obviously important in the effective control and administration of the business as a whole. The majority of managers in this team are steadily focused on achieving goals and meeting organisational outcomes, challenging colleagues to remain on task where they are at risk of being distracted by other environmental factors, but they may do so without regard to ensuring a harmonious working environment. They will also have a tendency to be more cautious in their approach and may be reluctant to innovate. Innovation and drive in the team will come from the the ‘north east’ colleagues, however they may become frustrated by the caution, risk aversion and occasionally suspicion, displayed towards change by their immediate (and the majority) north west colleagues. Innovation and creativity can also be provided by people located in the ‘south east’ region, but there is no one of this values profile in the team. 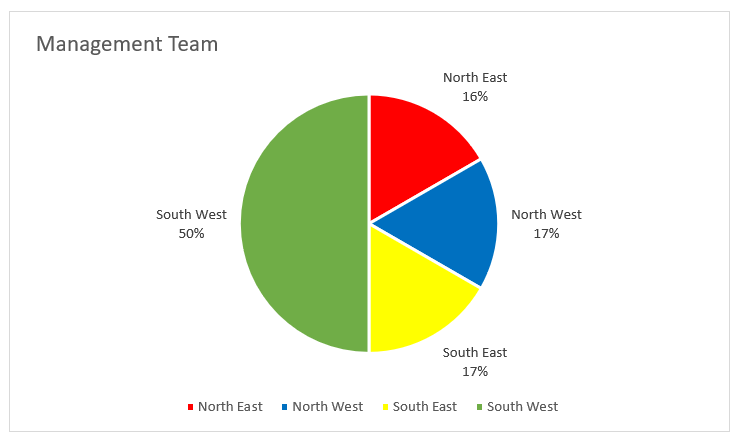 The remainder of the team sit in the ‘south west’ region. Their focus on the wellbeing of those they are responsible for will ensure that the needs of staff and clients remain at the heart of service delivery, building natural relationships and effectively managing change across the organisation (as soon as they are convinced by the direction of travel themselves). In summary, adapting to change or innovation will not come easily in the organisation and recognising that an injection of extraversion, and respecting and accepting why it is required, may improve performance, from responding to market changes more dynamically to exploring new recruitment channels they had been unlikely to discover through innovation and experimentation. Client B’s management Team values profile group includes representatives of all four regions, providing a split of individuals with natural care values and tough decision makers, ie intraverts and extraverts. This is a positive sign in any management team. 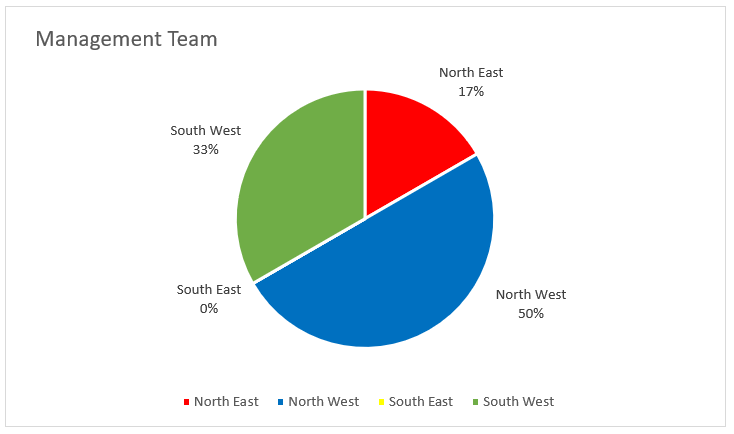 The imbalance in favour of the south west region, is often to be expected in an organisation which requires to be so ‘people’ focused. However, they, along with their north west intraverted colleagues, will be cautious through periods of change and in embracing new processes. If the managers from the north and south east ‘extraversion’ regions are overshadowed, the team overall may be missing out on the innovative and motivational perspectives these extraverts naturally bring to the table. Understanding the dynamics and values of individuals and teams as a whole can shine a light on potential areas of conflict or organisational roadblocks. Our experience has been that a huge amount of benefit can be obtained from the management team sharing their values profiles among themselves to understand what each person brings to the table and where their strengths differ and how this can be used to the benefit of the team and the business as a whole. In some cases, roles and responsibilities and planning strategies have been redefined to ensure each person’s perspective is included and considered in light of their unique values and insights, creating a well-rounded and more effective management team as a whole.